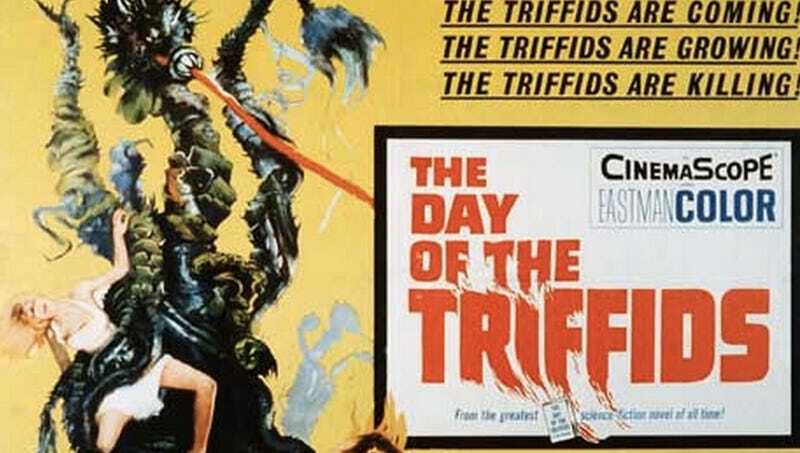 The 1962 "so bad it's great" The Day of the Triffids movie is getting a remake that kind of sounds rather awesome. Mainly due to the people the studio just hired to remake the gigantic, deadly plant movie. Deadline is reporting that Mike Newell of Donnie Brasco and Harry Potter and the Goblet of Fire will be replacing Sam Raimi as director for Day of the Triffids, which is kind of amazing. He'll be working with a script from Mama writer Neil Cross, another great score. The movie is centered around a mysterious comet that blinds most of the population on Earth. Those who remain are forced to battle the deadly plant monsters with poison whips and the ability to walk around on their roots. Not sure if Raimi will remain involved in the project, but we hope he does. Wither way getting Newell is a score for wacky movie nerds everywhere. This might actually be good!